Multiple national news outlets are reporting President-elect Donald Trump is set to pick Cathy McMorris Rodgers, a Republican congresswoman from Washington state to lead the Department of Interior. She’s seen as friendly to industry, drawing criticism from some environmentalists. But others think she’s a relatively moderate pick. 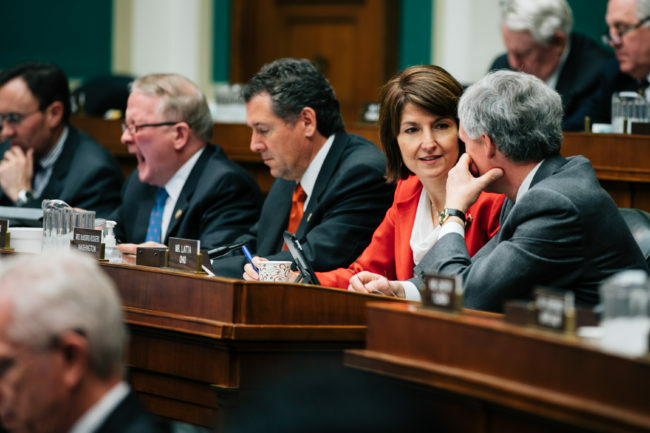 McMorris Rodgers is one of the highest-ranking Republicans in the House of Representatives, where she’s served since 2004. She chairs the House Republican Conference and sits on the House Committee on Energy and Commerce. Many Americans got to know McMorris Rodgers when she delivered the Republican rebuttal to President Barack Obama’s State of the Union in 2014. State leaders hoped an Alaskan would land the Interior job; former Gov. Sarah Palin and former Lt. Gov. Mead Treadwell were both rumored possibilities. But some Washington insiders say the fact that Trump picked a leader from a Western state is a good sign for Alaska. “You’ve got a Westerner that understands the need for the Department of Interior to be a good neighbor and to work with the states,” Robert Dillon said. Dillon is a former longtime staffer for Senator Lisa Murkowski. He now works for the American Council for Capital Formation, a Washington, D.C. think-tank. About 60 percent of land in Alaska is federal, and much of it managed by the Interior Department. McMorris Rodgers will oversee pivotal decisions on oil exploration and drilling on federal lands and waters. Dillon said McMorris Rodgers is likely to take a different view on these issues than the current Interior secretary, Sally Jewell. “What you’d hope to see is a re-balancing that takes into account the economic needs of the state and the people of Alaska,” Dillon said. A number of environmental groups have already released statements objecting to McMorris Rodgers. She has often voted to expand oil and gas exploration on public lands, including a bill that would have allowed drilling in the Arctic National Wildlife Refuge. She has also voted in favor of limiting the president’s ability to designate national monuments. Kristen Brengel is with the National Parks Conservation Association. Addressing climate change has been a big priority for the current Interior secretary. Environmental advocates note McMorris Rodgers has been noncommittal on whether climate change is caused by humans. But some conservation groups say even though she wouldn’t be their first pick, McMorris Rodgers is someone they can work with. Whit Fosburgh, President of the Theodore Roosevelt Conservation Partnership, sees her record as a mixed bag. President-elect Trump hasn’t yet formally nominated McMorris Rodgers for the position. And experts say even if she’s confirmed, reversing Obama-administration policies on federal lands won’t happen overnight.